Access to Information is increasingly becoming an important topic. Government has recognised that it is important for citizens to get information about what government is doing, and a draft law is in the works. There is a lot of work to do: an IPPR report last year found that most government institutions are not responsive to requests for data, or refuse to give our information when asked by Namibians. The Afrobarometer survey conducted at the end of last year suggests that Namibians share a view of a government that is unwilling to give out information. The survey asked Namibians whether they thought they would be able to find out four types of information: development plans, school budgets, who owns a piece of land, or how to register a business. 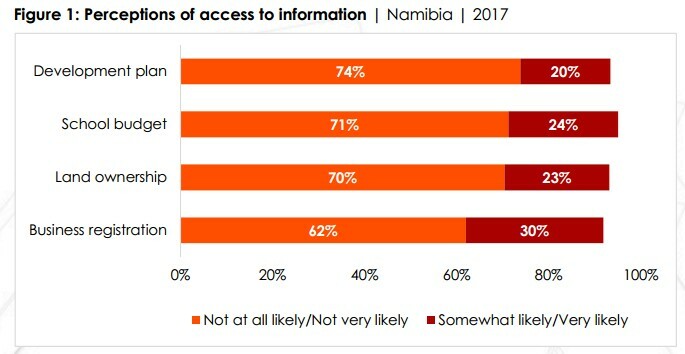 Overwhelmingly, Namibians said they would not likely receive the information they asked for. This finding indicates that we have a long way to go before we become an open society. Government needs to be better at opening up information to the public, and people have to believe they can get it — and then actually request it, of course. Here is our press release on this issue. On the same day also released results on Namibian’s views on corruption, as well as their levels of trust in government institutions — find the dispatch here. Our full presentation of those two sets of results is here. The summary of results for this round of the Afrobarometer can be found here.